This multi-purpose device from Panasonic has it all - from wide 48 tweezer epilation head to shaver head with trimmer and six attachments including a pedicure buffer for foot care. Currently retailing at around $68, seems like pretty good value for money for what you get. Overall, a very positive review. Panasonic's ES-ED90-p Epilator is rechargeable, designed for cordless use and can be used wet or dry. ​It can double as a shaver, using the easily interchangeable shaving head with pop-up trimmer. The pedicure buffer head is a great added bonus. Featuring a 60 degree flexible head, it easily fits against the skin at all times, to pick up and remove hair as short as 0.5mm in length. The product comes complete with a 2 year limited manufacturer's warranty, covering defects (USA and Puerto Rico) or 1 year's Pan European Warranty (in all cases you will need to provide your receipt and warranty documentation (issued at time of purchase). Other models in the series are the ﻿﻿﻿Panasonic ES-ED70-G (5 attachments - excludes pedicure buffer) and the Panasonic ES-ED50-N (4 attachments - excludes compact gentle epilator head and pedicure buffer). Epilation Head for Legs and Arms - complete with fast cap, gentle cap and protection cap for storage. The device has two speeds - "normal" and "soft". When you turn on the epilator by pressing the button on the front, the epilator automatically operates at normal speed. ​Normal mode is the faster of the two and allows for epilation to be performed in the shortest time. To change to soft, press the button again - a green lamp will light up to indicate that the device is in soft mode. ​Soft mode slows the rotation speed of the discs to minimize personal discomfort and irritation. ​The device is full re-chargeable for cordless wet or dry use (cannot be used whilst plugged into the mains). Full re-charging takes about one hour and gives 30 minutes epilation time. This is increased to about 40 minutes when using the gentle cap. A red light comes on to indicate that the device is charging and it goes out once full charge has been achieved and it is ready. There is a built-in LED light which comes on automatically when the device is turned on. The main epilator head is wide and has a series of 48 rotary tweezers, providing wide skin coverage, suitable for use on legs and arms. ​It comes with 2 easily snapped on cap attachments, one for fast epilation and one for gentle epilation, recommended for first time users or those with sensitive skin. As you can see from picture B, the ​gentle cap has a skin protector to hold skin down whilst epilating. This provides a gentler epilation designed to keep discomfort to a minimum. This epilator head pivots by 60 degrees (30 forward and 30 backwards) so that good contact can be easily maintained with the skin around all contours of the treatment area. The narrower, gentle epilation head is designed for use on the more sensitive underarm and bikini line areas. There are 18 sets of tweezers on this head - 9 on each side in sets of 3. ​The shaver head (1) features hypo-allergenic blades and foil and a pop-up trimmer (2) for long hairs and trimming the bikini-line. The pop-up trimmer is revealed by pushing up the mechanism on the front of the shaver head (as shown). It is concealed after use by simply pushing the mechanism back down again. There is a bikini comb attachment (3) which can be snapped onto the shaver head to gently trim the bikini area and keep it neat and tidy. ​The foot care head is for filing calluses and hardened skin on the feet only, typically found around the heel and ball of the foot. It should not be used on blisters, corns or warts. It is designed for dry use , not in the bath or shower, although it is recommended for use within 30 minutes of bathing or showering, when the feet are clean and dry and the skin is softened. Essentially, epilators work in the same way as tweezers, but are able to pluck multiple hairs at once, making them much quicker and suitable for large areas. The Panasonic ES-ED90-p has 48 sets of rotating metal plates in pairs​, 24 sets on each side, in rows of four. As the sets rotate the plates are brought together to grasp the hairs and pluck them from the root. This is the obvious next question, and is rather subjective, depending upon the area of the body being treated and each individual's pain threshold. Simply, because the hairs are pulled out at the root, epilating is painful - if you have used tweezers, then perhaps you can imagine the pain from plucking one hair multiplied many times. The epilator is suitable for use on the legs and arms using the main head. Underarms and bikini line can be epilated using the smaller, gentle head. How long it will take depends on the area being treated and which speed you are using. As a rough guide, we found that around 20 minutes was sufficient to epilate both legs using the large head in normal mode. ​These quickly pass and are likely to lessen over time, as the skin becomes more tolerant and regrowth is finer and less dense. It is advisable to use the epilator when you are not planning to go out imminently, until you know how your skin is going to react. It is important to read the manufacturer's instructions carefully, especially all the safety precautions prior to use. Below is given a basic summary of how to use the ES-ED90-p as per the quick user guide provided with the device. 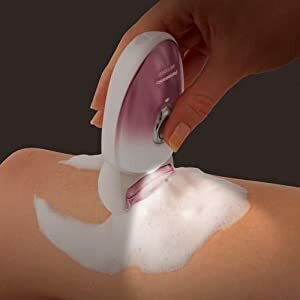 Choose Epilator Head - depending on the area to be treated, choose either the large, pivoting head for legs or arms or the compact, gentle epilator head if you are epilating underarms or bikini-line. Attach Correct Cap - this applies if you are using the main head, you can choose the fast cap or gentle cap (recommended for first-time users or those with sensitive skin). Taut Skin - make sure skin is held as taut as possible with your spare hand to make hairs stand up and reduce risk of "pinching"
The device should be operated within a temperature range of 5 - 35 degrees centigrade. Wet - wet the discs and blades and apply liquid hand soap, turn the switch on so that the soap foams up. Always replace protection caps to the head after use for safe storage, to preserve the life of your epilator plates. We have published a separate article with full information on the pros and cons of epilating vs waxing. The advantages that use of an epilator for hair removal has over shaving are clear, ​but of course shaving has the major plus of being pain-free. Where is the Panasonic ES-ED90-p Made? ​Can the epilator be used on the face? ​How long does the battery last when charged? ​Can the epilator be used while it is plugged in? ​Is it possible to purchase replacement parts e.g. foot buffer stone? ​How often do you need to epilate? ​Can the foot buffer be used on corns or warts? How do you know which speed the device is on as there is only one button? This is a good, efficient product from a well-respected Brand. Current retail price is around $68, so you get a lot of added extras for your dollar. The epilator is versatile, offering both quick and gentler epilation, suitable for larger areas or the more sensitive underarms and bikini-line areas. I found it to be very efficient at removing hairs with few passes, and this is borne out by the many good online reviews for the product. The shaver, whilst a good addition for bikini trimming and shaving before epilation, is probably not as efficient at achieving a close shave as your usual dedicated electric shaver.